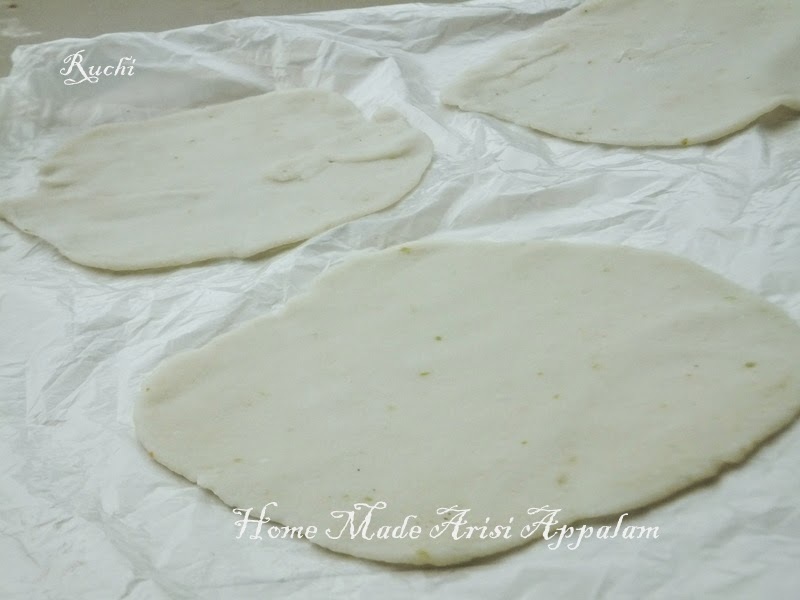 Appalam is a basic part of many South Indian meals and no festival or ceremony dinner is complete without appalam on the menu. In my home every one loves Appalam. whenever I go to my husband home town kalidaikurichi i used to brought various type of Appalams. 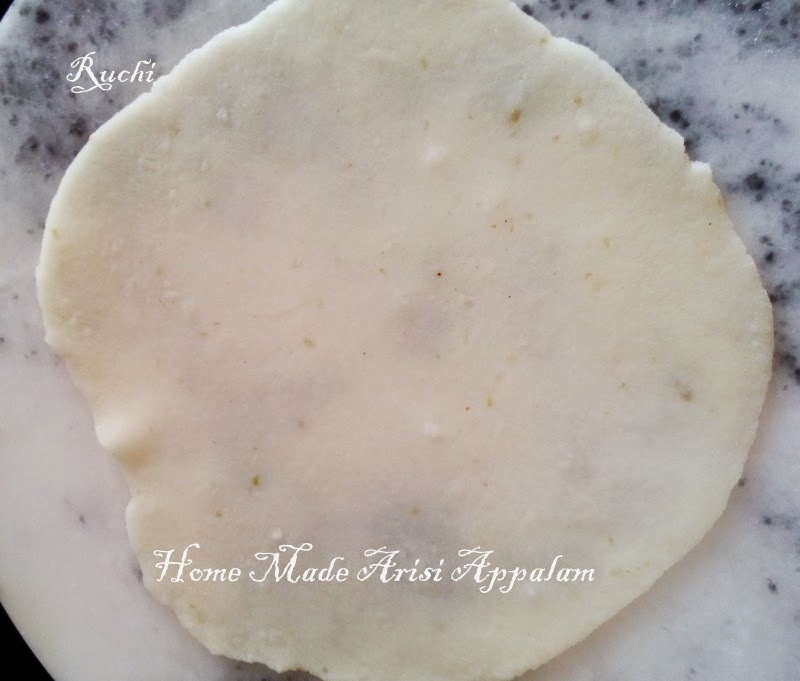 In Kallidaikurichi Appalam making is a major cottage industry. There we love to eat Appalthu urundai . 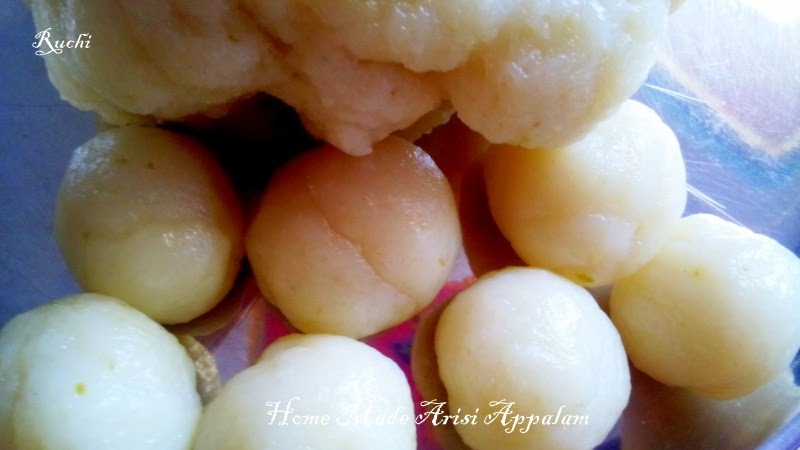 But me & my children loves Arisi Appalam.So This time I decided to prepare rice/ Arisiapplam at home. After so many errors I succeed making Arisi Applam.whenever I prepare new things I make it in small quantity.In this measurement I got 25 appalms. 1.Soak sabudhana in hot water for 10 to 15 min. peel the skin of pirandai. cut into small piece and Then grind it along with greenchilli&sabudhana in fine paste. 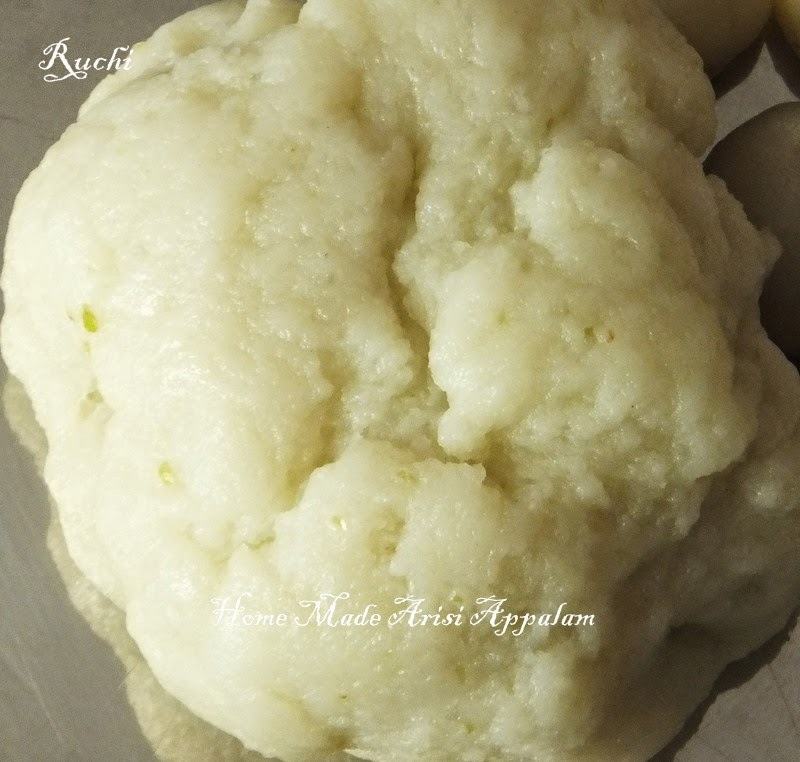 2.Mix rice flour ( I had home made rice flour) and grinded sabudhana with required amount of salt. The consistency should be quite thick.If needed Add small amount of water. 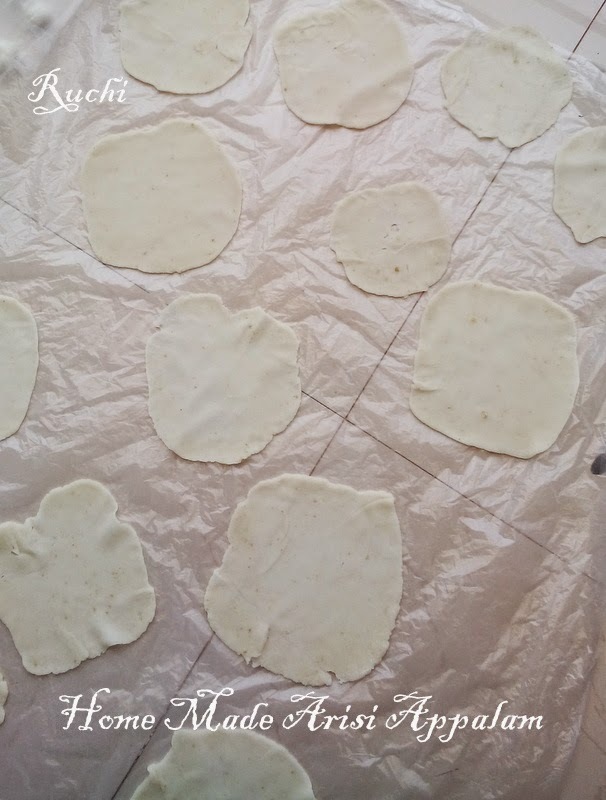 3.In an Idli stamer make it as a big ball and steam it for 10 minutes . Then remove from Idli steamer allow it to cool. 4.Further take it out and add lemon syrup and Asafoetida mix it properly. Then mash it for a while and with the help of coconut oil . 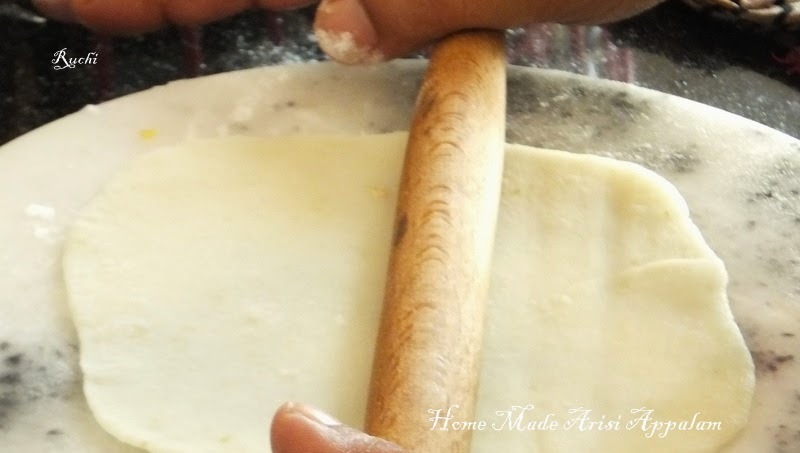 5.The dough is pounded in the stone mortar (Kal Ural)or in food processorto make the dough soft.. I put the dough in mixie for few seconds and rest pounded by my hands. 7.Repeat this procedure for all the balls until all the balls are over. 8.Once dried fry these in hot oil, they “puff up” or curl when they are done. They have a delicate crunch and are absolutely delicious. I think you get rice appalam in ambika depot in Mylapore. esp seetharamanappalam & anjeneya appalam brands of Kalidaikurchi are too good.I think if you place oreder they deleiver through courier. hi,is it ok if we leave pirandai in this recipe?i don't have that.